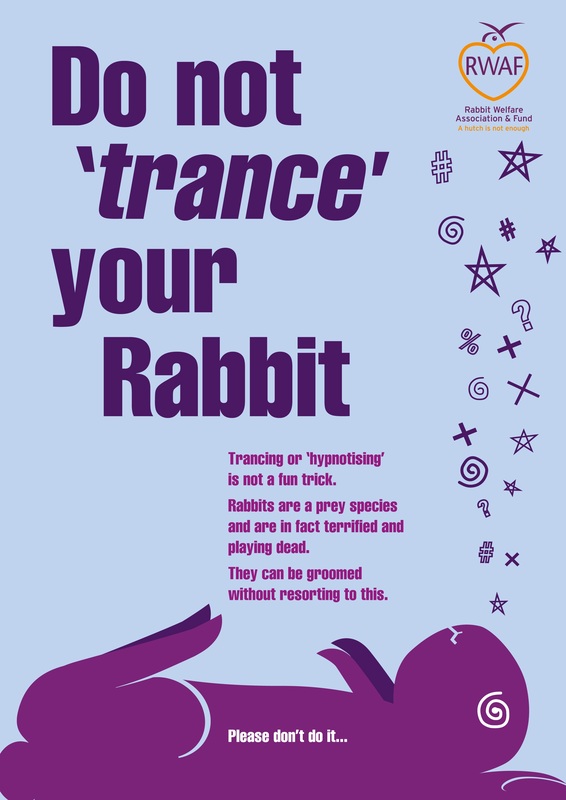 Tonic Immobility, often referred to as “Trancing” or “Hypnotising”, is a technique for handling rabbits that has been around for many years. It takes advantage of the rabbits’ tendency, as a prey species, to “play dead” and stay immobile when placed in a vulnerable position, on its back. In studies, behavioural observation (facial expression, ear position etc) and physiological monitoring (heart rate and stress hormone levels) suggest that the rabbits are both well aware of their surroundings, and are exhibiting a fear response rather than being calmed by the position. It is also very important to note that, even if they do not react, they are still perfectly capable of feeling pain. Although the resulting immobility makes procedures easier for the owner, and repeated use appears to make it easier to perform in the rabbit, it is not good welfare practice to use this technique in prey species. 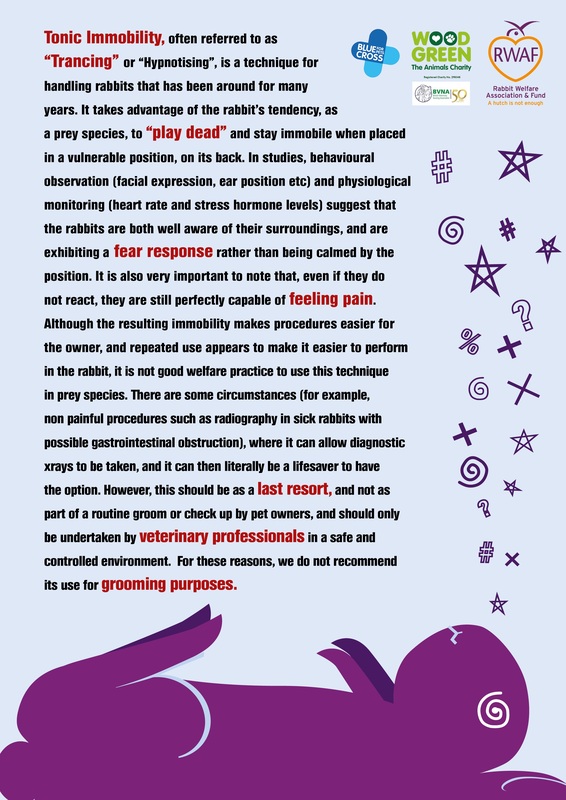 There are some circumstances (for example, non painful procedures such as radiography in sick rabbits with possible gastrointestinal obstruction), where it can allow diagnostic x-rays to be taken, and it can then literally be a lifesaver to have the option. However, this should be as a last resort, and not as part of a routine groom or check up. For these reasons, the RWAF does not recommend its use for grooming purposes. It is not cute, and the rabbits certainly do not enjoy it. Owners should never do this to ‘cuddle’ their rabbits.